There are several movies in which John Wayne and other actors of that era don big metal helmets and dive down to the bottom of the sea. In these films, the hero usually ends up battling a giant octopus that is guarding a sunken treasure, often in the wreck of a sailing ship. Along the way, he strolls along like an astronaut on the Moon, in an equally wondrous and alien world. Having grown up with these films, I looked upon helmet diving as a grand adventure. Accordingly, I have long been intrigued by the helmet dive shore excursions that are offered by some of the cruise lines in various warm water ports. 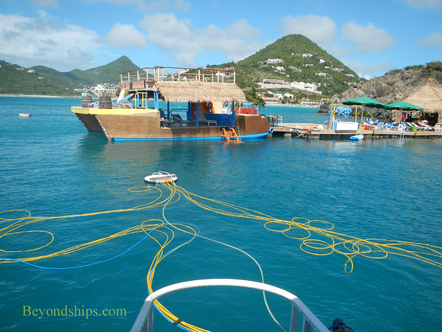 Finally, during a port call in St. Maarten, circumstances permitted me to indulge this thrust for adventure. 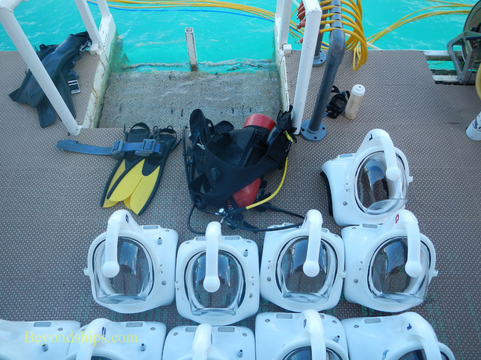 This modern day version of helmet diving is the creation of Sea Trek, which provides such excursions in a number of Caribbean ports as well as in Florida and Hawaii. Gone is the heavy brass helmet, canvas suit and weighed metal boots. In its place is a helmet made of modern composites. No special suit is required - - all you wear is a bathing suit and a pair of aqua shoes, which you can borrow from the operator free of charge. Speaking with the shore excursions people on the ship, I learned that during the excursion, the participants would walk around a trail that had been laid out by the operator. In other words, no wandering off on your own. Along the trail, there would be a number of sights to see including a wreck (obviously, the site of the sunken treasure) and lots of marine life (undoubtedly, a reference to the giant octopus). 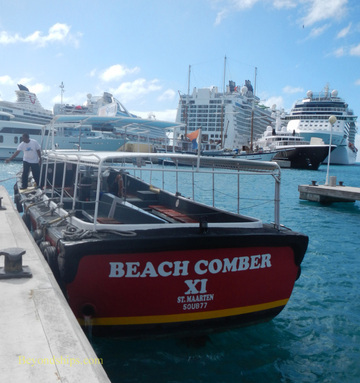 After our cruise ship was cleared by the authorities in St. Maarten, the guests taking this shore excursion met on the pier by the ship. There were about 16 people altogether. It was a diverse group including a family from Japan with young children, two women who were experienced scuba divers, a young honeymoon couple, a couple from the UK who were cruising on another ship and a solo senior who like me was seeking an undersea adventure. The representative of the tour operator passed out documents that required you to answer numerous questions about your health and physical condition. Along with it was a lengthy liability wavier that you were required to sign. Perhaps this excursion was not going to be so tame after all. Above: The boat that took us to the dive site. Once the preliminaries were out of the way, we walked to a boat that was moored near the water taxi terminal. It was to take us to the dive site. We sped across the Great Bay. The driver pointed out the ruins of an old Dutch fort overlooking the bay. He also gave a preliminary briefing on how the dive would be conducted. 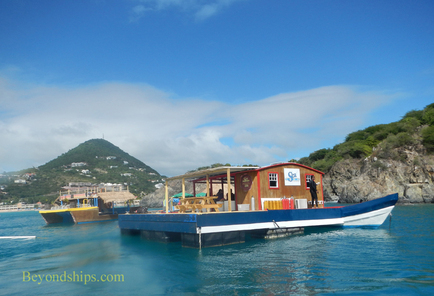 Instead of going out to sea, the boat rounded a point and entered Divi Little Bay. There close to the shore were some barges with wooden huts anchored next to a rocky shore. This was the dive site. The boat pulled up next to one of the barges. Our group climbed onto the barge. Another group who had just been on the underwater walk took our place in the boat for the return trip to the cruise port. Above: The barges at the dive site. Below: The dive site from the surface. Note the floating manifold which supplies air to the helmets. We were asked to assemble in the hut immediately. One of the operators began by saying that because of the storms that had taken place the night before, the sea bottom was somewhat stirred up. As a result, visibility was limited to about eight feet. This was much less than usual but still sufficient to go ahead with the tour. However, if anyone wanted to leave, they would arrange to return their money and they could go back on the boat that was now preparing to return to the cruise port. Only one family took him up on that offer.